Olson spent most of his life in the Ely, MN area. For more than thirty years, he worked as a canoe guide during the summer months in the Quetico-Superior country, then taught and wrote about natural history, ecology, and outdoor life. 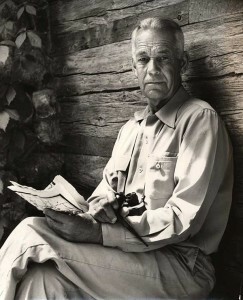 He helped draft the Wilderness Act of 1964, as well as to establish Voyageurs National Park in northern Minnesota, Alaska’s Arctic National Wildlife Refuge, and Point Reyes National Seashore in California. Is it crazy to do something crazy in order to become less crazy, to seek to restore that sanity and equilibrium? Susan and I are about to set out on an adventure that should be fun, enlightening, challenging, even joyful, but which I question in my saner moments. It was a wonderful trip in many ways. We stayed up most of one night watching a rare display of the Aurora Borealis, which filled the sky for hours. The sun was shining, the fishing was good, and there was great singing, story-telling, and endless argument about the meaning of life around the campfires. However, the trip ended in disaster, as you can read in the post linked above. Coincidentally, Olson wrote about the area in a National Geographic article, “Relics from the rapids,” which appeared the very month we returned from that trip. Although I’ve canoed nearby, I’ve never been back to Quetico itself and certainly not to the Picture Rocks where the disaster occurred, until now. The Side Lake to Sarah one known as “Heart Attack Hill” did me in but it was hot, I was low on water, and I had too much gear. I remember laying down at the top and seriously thinking that I could die. It’s rough. The quiet beauty of Quetico derives in part from the fact that there are no trucks to move your gear. There’s also no wifi, no cell phone signal, no motorized boat craft, no flights overhead, no buildings or pavement, and no prepared campsites. Those features are 99% heavenly, and only worrisome if you choose to worry. The major concern we have is that we’re going at the start of the season. Guidebooks suggest that June and July are uncrowded, but have more mosquitoes; August and September are warmer with fewer bugs, but more competition for good campsites. No one talks about May, because it’s too cold and the ice may not be out. Even the Canadian ranger stations are closed. In their April 19 “dispatch” from BWCAW, Amy Freeman and Dave Freeman show photos of sled dogs, a snowman, and frozen lakes. 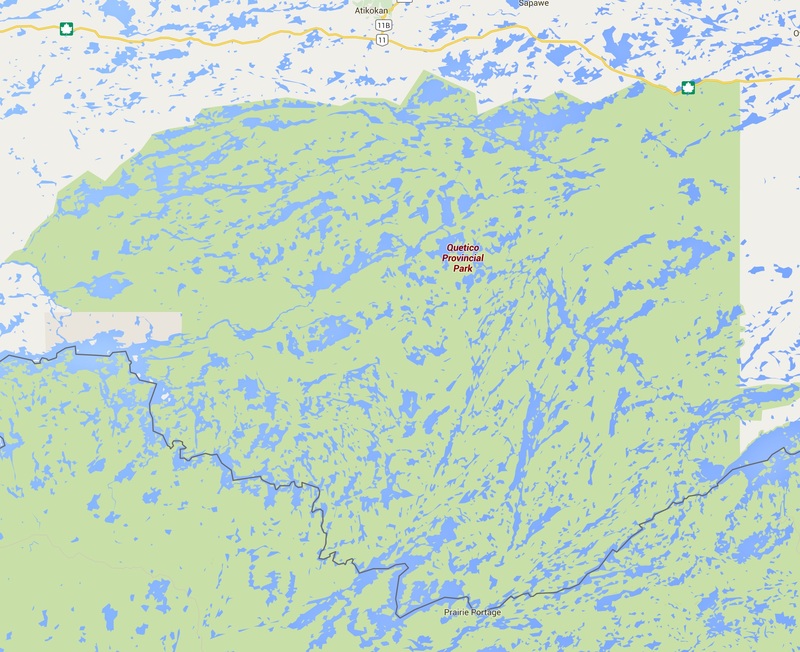 This is from the year they’re spending there, which is south of Quetico and possibly a degree or two warmer. We’ve been told that the ice should be out on most lakes by the time we start and the day that this post should appear (May 4). I’m too charitable to think that that optimism on the ice forecast reflects the outfitter’s desire not to have to return our deposit! Nevertheless, we’re committed to the trip. We’ll be renting new equipment, including a Wenonah Minnesota II kevlar canoe. We’re relying on a good outfitter in Ely (Piragis). We have maps, long underwear, extra socks, compass, signal mirror, and poison ivy lotion. Could anything go wrong? Stay tuned for Part 2, when we return. Here are some photos from my trip to Quetico Provincial Park in August 1963. Notice the water damage on the 35mm slides, which is explained by the story that follows the photos. 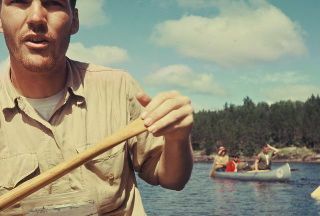 In August of 1963, our Explorer Post 52 traveled to Ontario’s Quetico Provincial Park just west of Lake Superior on the Canada-U.S. border for a wilderness canoe trip. In order to get to Quetico, we journeyed for three days from Fort Worth in what was even then an old, yellow school bus. We stayed in Air Force bases, sleeping on the gym floors and experiencing steam baths for the first time. This was a year of changes, including the arrival of the Beatles in the US and the assassination of President Kennedy. But the trip was the major event in my life that year. It was a wonderful trip in many ways. We stayed up most of one night watching a rare display of the Aurora Borealis, which filled the sky for hours. The sun was shining, the fishing was good, and there was great singing, story-telling, and endless argument about the meaning of life around the campfires. It was good exercise, too, especially with the canvas packs of those days. On portages, one of us would carry the canoe, one a food pack, which weighed 110 pounds in the beginning, and one all our gear–cotton sleeping bags, canvas tent, and clothes. We had been out for at least a week when the storm came up. It was on the Basswood River, but in a wide section, like a long lake. When the storm arrived, we decided not to risk a crossing and pulled into a cave a the base of a huge granite cliff with pictographs. 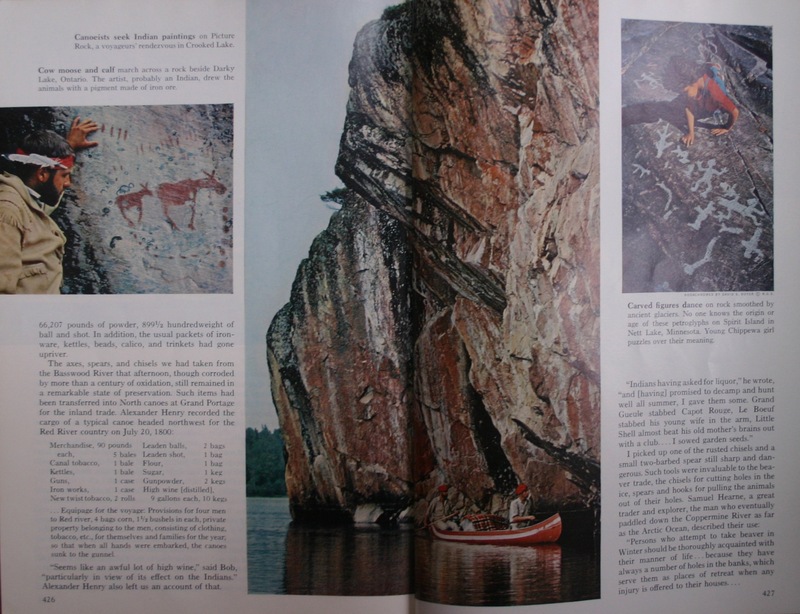 “Picture rock” on Crooked Lake was shown in the September 1963 National Geographic, and I recall seeing the Basswood cliff when I returned from the trip. I held my canoe onto the rock under this 100-foot cliff, as did Fred Moyer, our guide. The other two canoes held on to us, locked together to avoid capsizing. After a few minutes, I released my grip on the rock for just a moment to tighten my poncho. As I did, lightning struck a solitary tree at the top of the cliff. The current traveled down the cliff to our cave. Everything went suddenly white, for some indefinite period. If you told me today that it was ten seconds or just one, I wouldn’t be able to dispute it, because time didn’t exist for me then. I could feel the charge in the air, and am still sensitive to changing electrical conditions. When I’ve felt that while canoeing, I get very nervous. The current reached Fred’s hand, which was still touching the rock. His canoe, which was the only wood and canvas one, was shattered. Bob Cocanower and Gary Rall were the two scouts in Fred’s canoe and they both suffered physical injury from the lightning: Bob’s arms were paralyzed and Gary’s legs. Fred was killed instantly. After Fred died, Chuck Borgeson and Duane, the guide from a companion group, took his body to the ranger station (see Bobby’s account, too). I must have gone into shock, because I went to sleep later that morning and slept until the next day. We, of course, cut the trip a short from what was planned originally, but not by much, because there wasn’t an easy way just to exit from such a remote location. The accident was reported in Texas newspapers as “lightning strikes Scout group, at least one killed.” Naturally, our parents were distraught, but unable to learn much about what had happened for several days. This was well before cell phones and we had no portable radio. It’s sobering to realize that I was the only one other than Fred holding on to the rock just before the lightning struck. If I hadn’t let go to pull my poncho, all 12 of us might have died, because it would have completed an electrical circuit connecting all our aluminum canoes. We managed to complete the trip without further mishap, but aspects of it are still vivid for me today. After the wilderness experience, we went to Winnipeg and found a restaurant that offered all-you-can-eat lunches for 49 cents. After two weeks of vigorous exercise and eating our own cooking of dehydrated potatoes, we were hungry beyond any measure a restaurant should have to endure. It wouldn’t surprise me to hear that we put them out of business. Coalson, Bob. The Fred Moyer incident. Post 52 history: Charles L. Sommers Canoe Base. Olson, Sigurd F. (1963, September). Relics from the rapids. National Geographic, 124(3), 412-435.